Situation 228km south of Auckland, Rotorua is a great option if you are looking for a day trip from Auckland. Rotorua is New Zealand’s most dynamic thermal area and it won’t take you long to catch a whiff of the sulphur-rich air distinctive to the city! However, the smell doesn’t put of many, Rotorua is one of New Zealand’s most visited spots by tourists with nearly three million visitors stopping in annually. Rotorua town was built along the southern shores of the New Zealand’s second largest lake, Lake Rotorua. Lake Rotorua was actually formed from the crater of a volcano – but don’t worry its last eruption was about 240,000 years ago! The Lake and its surrounding rivers provide a host of activities to keep you busy. Speeding at 80km an hour, the V8 powered boats are an exhilarating way to see the beautiful lake. The Kaituna river displays amazing scenery and is excellent for white water rafting and is in fact home to the world’s highest commercially rafted waterfall. Parasailing lets you grab a birds eye view of the Lake and takes you up 400 feet. For a more traditional tour of Lake Rotorua, climb aboard a Māori waka tangata (people’s canoe). Paddle the lake and hear the local history and Māori legends. Summer time is a great time to visit if you would like to try your hand at trout fishing. Rising summer temperatures force the trout to congregate in large numbers to colder water mouths, fish here and your odds of catching a trout are pretty good. You are more than likely to be catching rainbow or brown trout from Lake Rotorua. Because of the geothermal nature of the town there are plenty of natural eruptions of steam, mud and hot pools which you may spot when touring the town, but there are also some well-known spots where you are guaranteed to experience the impressive geothermal area. Orakei Korako should be on your ‘must see list’ when visiting Rotorua. 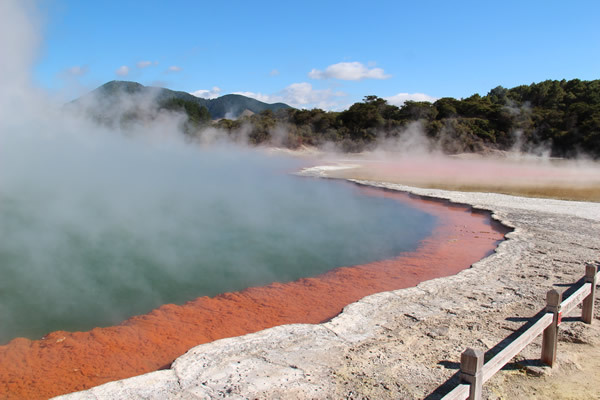 Orakei Korako displays New Zealand’s largest geyser field and truly is a natural wonder. Hell’s Gate is a well-known hot spot in Rotorua and is New Zealand’s most active geothermal attraction. It includes a mud volcano and the largest hot waterfall in the Southern Hemisphere. Tours at Hell’s Gate will take you through acres of bubbling mud, steaming cliffs, erupting waters, hot water lakes, and sulphur crystals nestled amongst native bush. 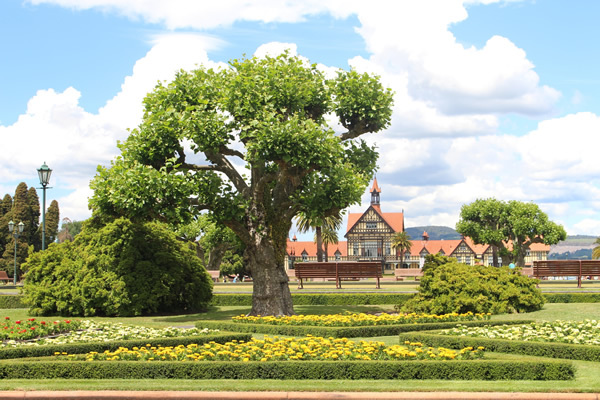 Indulge in the vast culture that Rotorua has to offer. 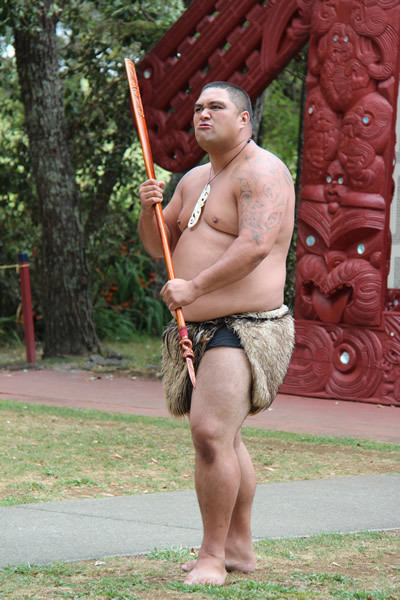 Visit the living Māori village of Whakarewarewa, watch Māori cultural performances of song and dance or learn to make your own harakeke (flax) basket with local expert weavers. A traditional geothermal Hangi (Māori feast) is like no other and should make it onto your menu. Rotorua is world famous for its mountain biking trails through the Whakarewarewa Forest. With a range of trails, from novice to expert, a ride through the forest is a great day out. After a busy day of taking in all that Rotorua has to offer, it’s time to relax and unwind. Rotorua is well known for offering fantastic spa and wellness therapies. Rotorua’s Polynesian Spa is internationally acclaimed and has been voted top 10 in the world. Offering hot mineral spring bathing and spa therapies amid picturesque views of the lake, it is well worth a visit. Hell’s Gate offers a mud bath. Soaking in a mud bath is a traditional technique used by generations of Māori to ease joint and muscle pain, perfect after a day of mountain biking! If you are ready to see all Rotorua has to offer, contact our team at Corporate Coachlines and see how we can get you there.